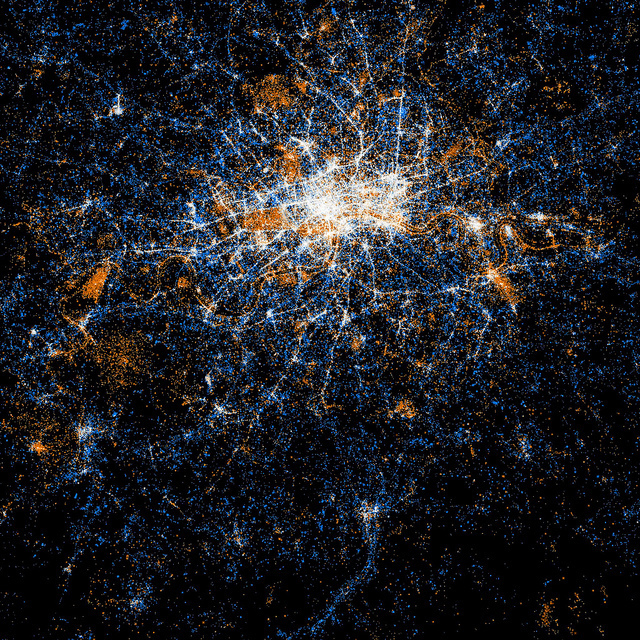 Eric Fischer, who we've previously seen map London's Flickr traffic, has come up with a new data visualisation: he's taken the Flickr data and combined it with the location of tweets from across the capital, to create the beautiful, dreamily abstract image above. The red dots represent Flickr pictures, the blue dots are tweets, while the white dots clustering around central London are locations that have been posted to both. To judge from this map, Twitter has a wider following across the city, while geo-tagged Flickr snaps are clustered around photogenic places like Greenwich and the South Bank. You can see the full-size image, as well as maps of other cities including Barcelona and New York, at Fischer's Flickr account.